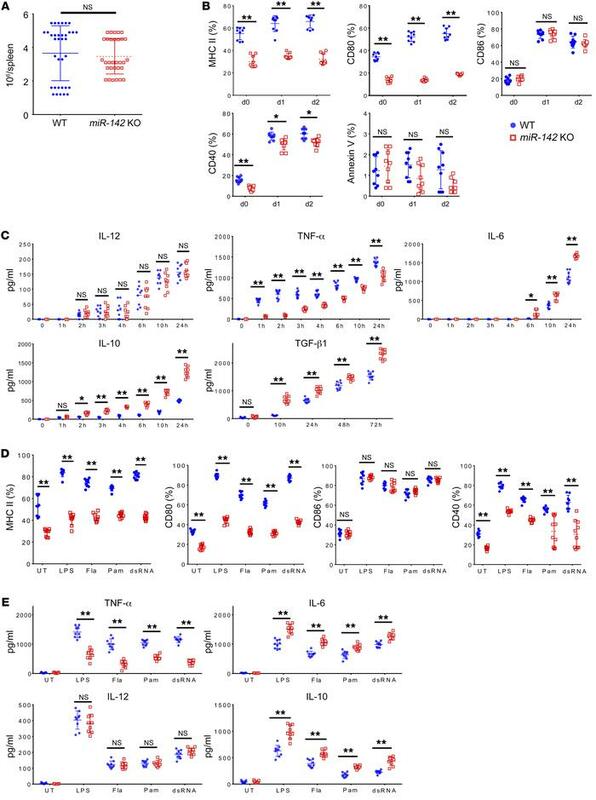 miR-142 modulates DC’s TLR responses in vitro. (A) CD11c+ DCs were quantified from spleens of WT or miR-142–/– mice (n = 30, mean ± SEM). Splenic WT or miR-142–/– DCs were treated with LPS or diluent control and (B) analyzed for expression of MHC II, CD80, CD86, CD40, annexin V (mean ± SEM) (data are combined from 4 independent experiments), and (C) cytokine levels by ELISA (mean ± SEM) (data are combined from 3 independent experiments). (D) Splenic WT or miR-142–/– DCs were treated with TLR ligands LPS, Flagellin, Pam3CSK4, and Poly(I:C) or diluent control and analyzed for expression of MHC II, CD80, CD86, and CD40 (mean ± SEM) (data are combined from 4 independent experiments) and (E) cytokine levels by ELISA (mean ± SEM) (data are combined from 3 independent experiments). Comparisons between 2 groups were calculated using paired Student’s t test (2 tailed), while comparisons between 2 groups at multiple time points were calculated utilizing multiple t tests (Holm-Šidák method). *P < 0.05; **P < 0.01. UT, untreated; Fla, Flagellin; Pam, Pam3CSK4.